The last time I saw my father alive was Father’s Day weekend, 2012. That means it’s been three years, and it’s incredible to realize both how long and short that feels. The urge to send a text about a climbing trip comes less and less, and now it’s more a quiet conversation in the back of my head. Three years. A lot can happen in three years. I like to be outside on days that make me think of my dad. I’ve had friends join me for hikes, I’ve climbed outside, I’ve climbed inside, I’ve been rained out. The actual thing doesn’t matter that much, so long as it’s something I think he’d have fun doing. This year, for the first time, I spent both days of the weekend with dogs. My dad always had dogs. First there was Mr Scott, a german shepard my grandfather swore my dad stole from him, who stood guard over me and my sister like we were his pups. Then there was Sadie, a beautiful german shorthair pointer who ruled the living room and went on point for small song birds in the backyard. She was field trained and some of my favorite memories of her are with my dad, his keys jangling off of a carbineer as he threw the canvas training bird. His last dog was Kobe, a block-headed and sweet yellow lab who went into the field a few times but was really happiest being spoiled by my dad and step-mom. There are more photos of Kobe than any of the other dogs, which means Kobe is in some of the last pictures of my dad where he really looks like the man I remember. 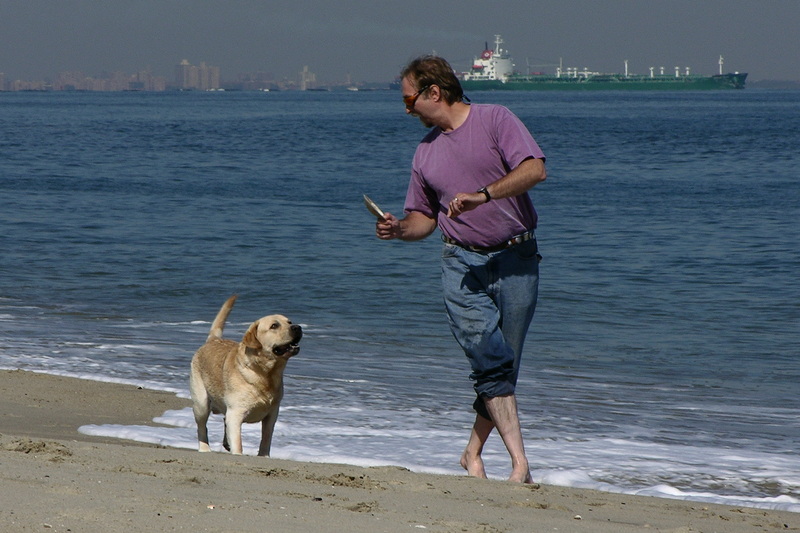 It was one of the last long weekends I spent with my dad and I remember walking along the shore in Long Beach Island with Kobe, throwing a stick into the ocean and watching the dog fearlessly jump into the waves, unstoppable. This is the first time I’ve had dogs in my life since moving to Seattle. Topher and Giles are adorable English Cocker Spaniel monsters. True field dogs, they excel at bringing me everything in my apartment, and it often takes a few minutes in the morning to track down shoes. They aren’t mine, but they love me anyway. We left early Saturday morning and headed out to the North Cascades to hike Lookout Mountain. I’ve spent a lot of time in the mountains this past year, but it’s been mostly alpine, with snow and a large group. It felt strange to grab a light day pack, even if I still made sure to bring a first aid kit, head lamp and spare lamp and bivy, just in case. WAC has me a little paranoid. The trail was surprisingly hard to find, a small pull out for a parking lot and a nearly camouflaged maker indicating the trail-head. From there, you head up. The trail is soft but constantly switch backing through a forest. Everything is covered in moss and light filters through the upper canopy like we are in some sort of fairytale. This place still feels utterly foreign, more Ferngully-primeval imagined world than the rolling hills of the East Coast. At one spot the trees open up but the underbrush crowds through and our legs are scraped by blackberry thorns and thistles. The dogs are on leash but relentless—despite their small size, they seem to have endless energy. 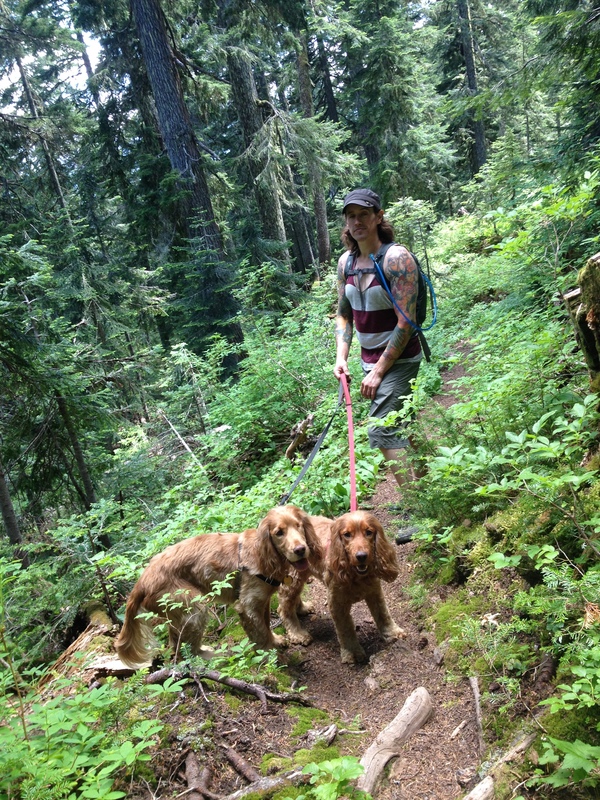 We let them loose when the trail pours into an alpine meadow and even tighter switchbacks. Wildflowers spill over the dirt and the dogs are russet slashes in green, bounding ahead of us and running back, over and over. We reach the fire lookout and the views are, of course, amazing. There’s a field of scrubby grass and we find a stick and toss it back and forth; Giles has a mouth of sawdust and a dog-grin. They sleep the entire car-ride back. In total—a 9.4 mile hike with 4500 feet of elevation gain/loss. Not bad for little doggers. It feels like a hike my dad would have done, though he would have been able to point at the mountains surrounding us at the top and named each one. He probably had stories for a few—of why he didn’t climb it or the adventure that happened when he tried. It’s frustrating not to know, to make these things up in my head. I spend Sunday with my friend Elaine and her dog Eugene. Elaine’s the kind of friend that understands difficult days and does what she can to help difficult days be a little easier. We meet up for a decadent brunch surrounded by the muscled men of Queen Anne. It’s a relief to be in a place with so many young people—there aren’t daughters with fathers anywhere near us. 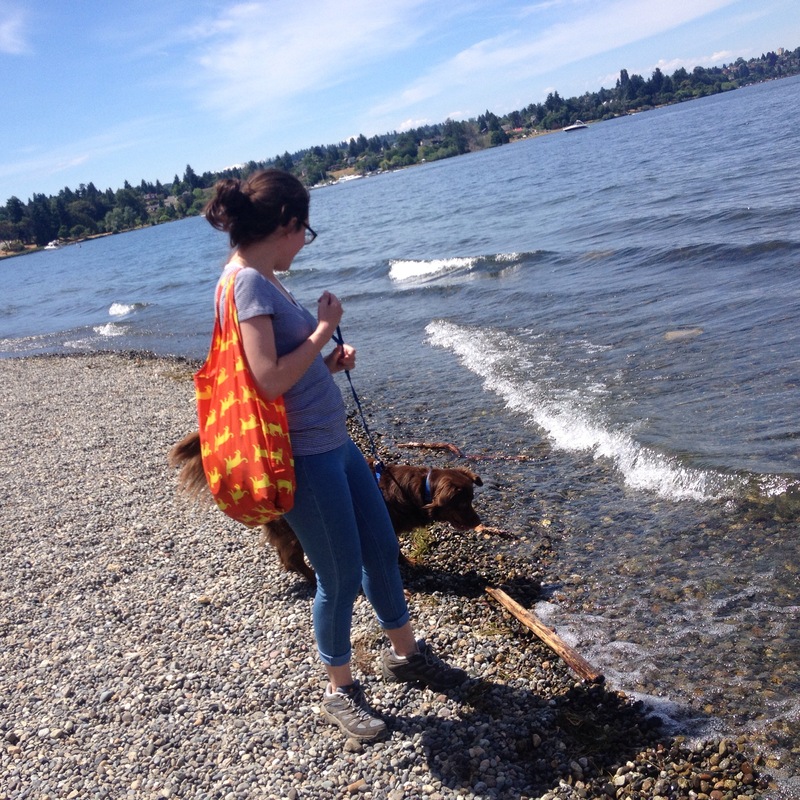 We head to Seward Park in south Seattle and Eugene happily stretches across the back seat of my car, her brown head against the fabric of the seat. When we take her down to the lapping waves of the lake, we realize—she’s never seen whitecaps before. These are tiny things, but they disappear in front of her and she’s afraid at first, before deciding she can Kill All The Water. We start calling her a Salty Seadog and she does her best to run off to kill more water, sending us chasing her down the pebbled beach. Once we get her back on a leash we walk for a while, exploring the old hatchery, dipping back to the water on the way back to let Eugene cool off before heading back to my car. We spend the rest of the day watching bad movies and meeting up with friends to watch the sun set and drink wine on a rooftop. It isn’t a very dad-themed day, but it’s perfect, surrounded by people that I care about, laughing and sharing stories. I think my dad would laugh if he found out that my plan, over Father’s Day weekend, was to spend as much time with dogs as possible. I think he’d like them all, though I’m not really sure. That’s the hardest part—I don’t get to send my dad pictures of Topher and Giles leaping over fences, or Eugene discovering how strong she is compared to water. I don’t get to tell him about my boyfriend and how he teases me for climbing mostly on ropes but, sometimes, puts on a harness and comes to my side of the gym. I don’t get to tell him about the group of women I know and how we easily move from climbing shoes to cocktail dresses, ready for whatever adventure we’ve created for ourselves. Jenny, me, Shams, Kyle and Paula. PC: Dude walking along who kept losing the trail, with Paula’s camera. I thought originally that, after Baker, WAC was over. We climbed our mountain and now it was time to disperse into our ordinary lives, with our friends and lovers from before WAC, and that would be that. It’s a class. Classes have an end point. I’m not really sure why I thought this—I never thought of poetry as being “over” when classes ended, I never thought of my writing community as something that would disappear once we stopped sitting shoulder to shoulder, pushing papers and books back and forth between our bodies. WAC is a network, a friend group, a community. It’s so much more than the class, so of course it didn’t end. One week after summiting Baker, I find myself driving against morning traffic to the Eastgate Park and Ride, my pack in the trunk, running for a bus I hope will take me back downtown for work. I’m not familiar with this Park and Ride; my friends usually meet at Mercer, so even the bus ride is an adventure that involves finding my bearings and a last minute bolt to the stop. Our plan is to summit Enchantment Peak and then, the next day, McClellan. 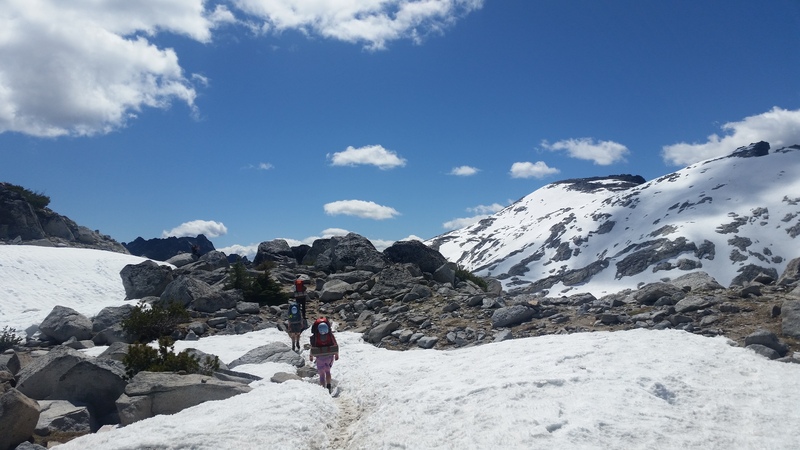 Both routes are scrambles nestled in the core of the Enchantments, and we’re headed out today because it’s the last weekend before permits go into effect. Shams and Kyle have a plan in mind but they ask Jenny, Paula and me to figure our own ideas out before they weigh in. They ask us questions about weather and gear and it’s an instructor climb, true, but it feels just like friends planning together. We decide to leave our tents behind in an effort to lighten our packs and we figure out who should bring stoves, who will bring fuel. I’m worried about my foot—the hike from Baker ended with me limping into the lot and bursting into tears as I hid in Sham’s car, pretending to look for something. It’s felt ok all week, and the Enchantments are too tempting to stay home. The last time I was here we through hiked the whole thing, and the idea of stopping along the way is enticing. We pull into the Snow Lake trailhead and already the lot is packed. 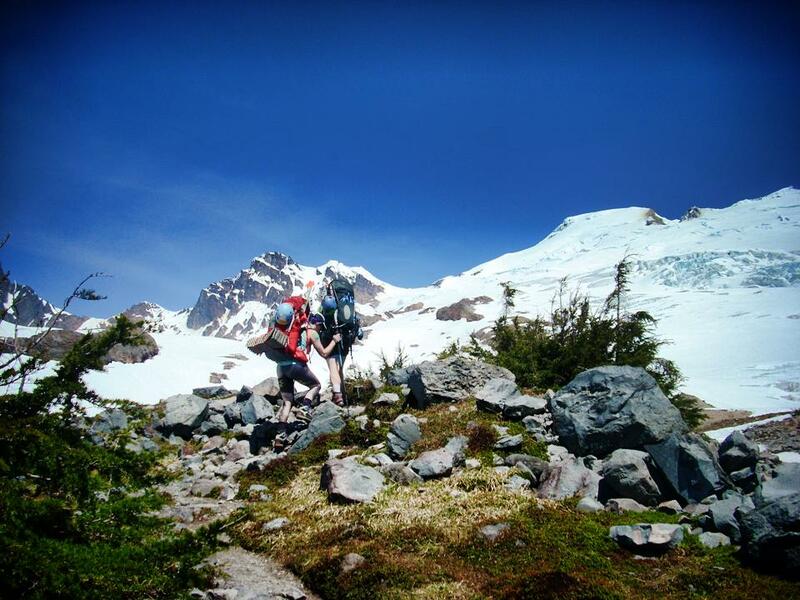 This is not going to be a wilderness experience—the snow levels are low enough that casual hikers and climbers alike are doing their best to get a weekend in before permits restrict access. We pile into Shams’ car and head up to the Stuart Lake trailhead, leaving Kyle’s car behind. 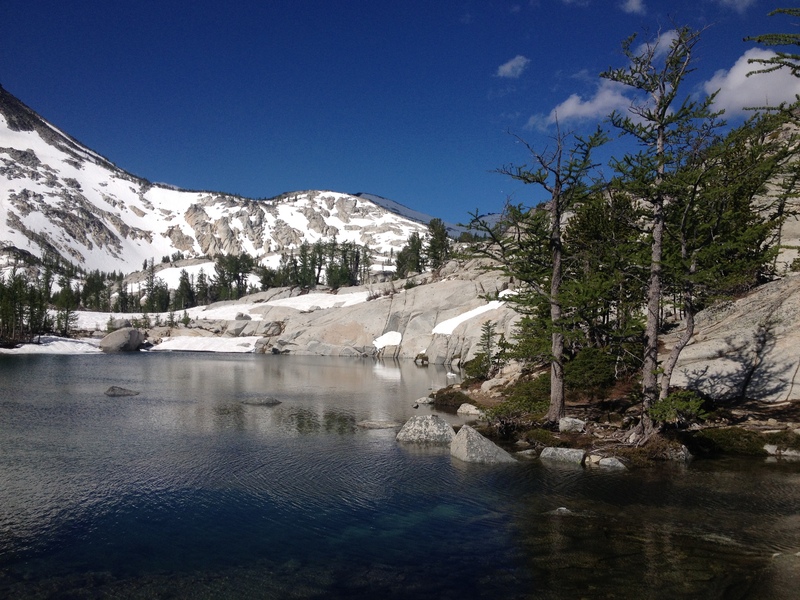 We plan to hike in to Colchuck Lake and bivy there, take on Aasgard Pass in the morning and climb Enchantment, then bivy near McClellan, summit Sunday and hike out. It’s about 18 miles from trailhead to trailhead, with 4500 feet of elevation gain, not including the peaks. Without his tent Shams tells us his pack is empty and starts taking things from us—my stove, all of our mountaineering boots, anything he can grab. “It’ll carry better if it’s packed” he tells us, but I think he’s also remembering how beat up we all felt a week ago and is trying to make sure we can survive this weekend without too much pain. I want to put up a fight, I can handle the weight and the rigor, but I’m also pretty worried about my foot and I’m happy to have a lighter pack and to be starting in approach shoes with more flex. The hike in is fairly mellow and, surprisingly, fairly empty. We run in to one other group that seems to have lost the trail and they start to follow us, passing back and forth as we go. They keep wandering off trail and joining us again, head lamps bobbing along in the night. At one point Kyle calls off into the darkness “This way!” and they follow us like ducklings. 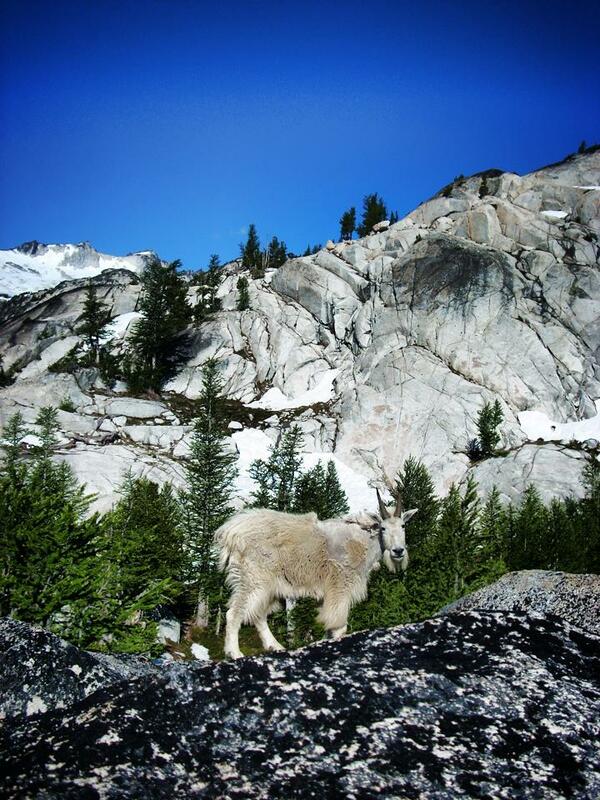 We get to Colchuck Lake and climb up a few boulders for a place to sleep. I’ve slept at a trailhead in a sleeping bag before, but this is the first time I’ve properly slept in the backcountry without a tent. With the mountains rising around us it’s hard to escape the feeling that we’re in some adventure story, striking out into unknown territory, until we see tents glowing around the lake and catch headlamps of a party taking on the pass under darkness. 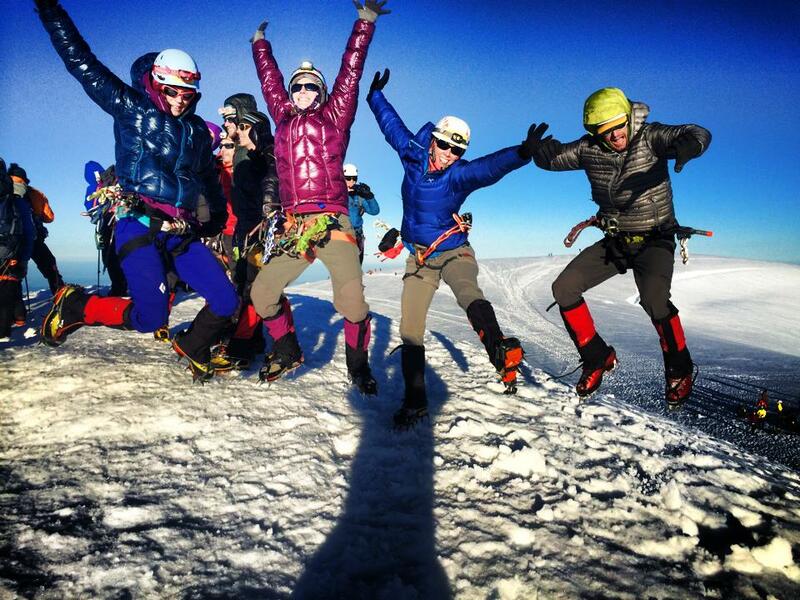 Our team is split into two and Jenny and I take “high camp” a few feet above Kyle, Shams and Paula. Venus and Jupiter dominate the sky and we fall asleep to shooting stars and muffled giggling from below. 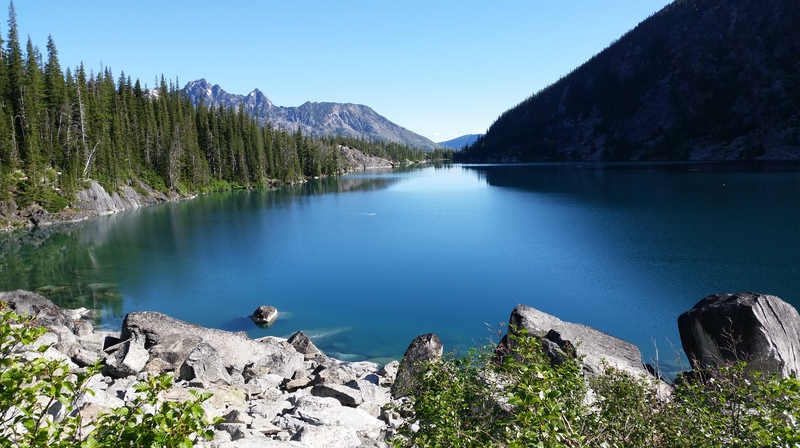 In the morning we can see flashes of color from the other folks bivying and camping around the lake—there’s a good reason the Enchantments generally require a permit. There’s frost on my pack and sleeping bag and Jenny and I make oatmeal while we wake up. Before we leave I start a dance party and succeed in getting Shake It Off stuck in everyone’s heads for the duration of our weekend. 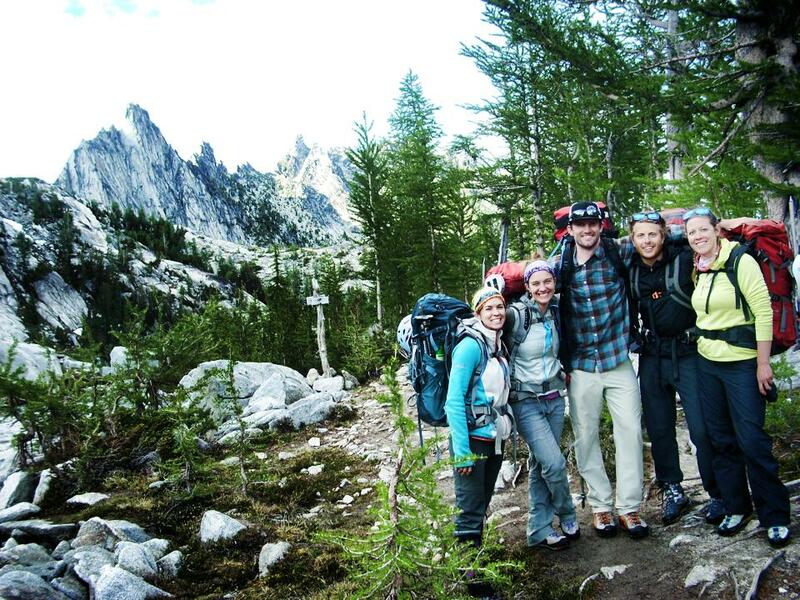 We leave camp in good spirits and head to Aasgard Pass. The trail around the lake is well maintained, but as we near Aasgard we have to trust ourselves that “up” is the right way and pick out cairns as we go. 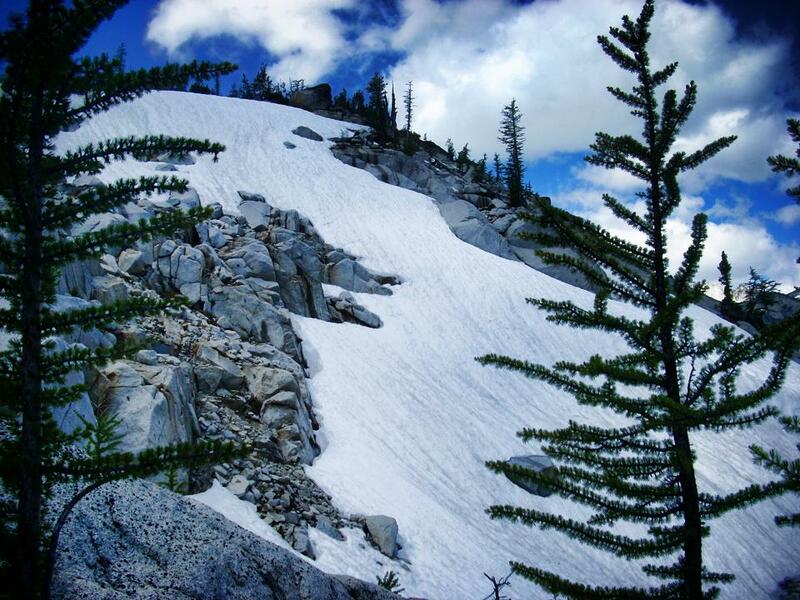 When I through-hiked this a few years ago, I remember Aasgard Pass being the hardest thing I’d ever done. This time, it’s merely brutal and manageable, a boulder field staircase next to a cascading stream with snow at the top and a beautiful lake at the bottom. We get to the top and stop to snack. “I’m lost, I don’t know where to go,” Kyle says, and hands us the map. We can see boot tracks following the trail through snow and we point out different peaks on the horizon, matching them to the topo. Dragontail, Prusik, McClellean. Paula takes the lead and we follow cairns and footprints towards Enchantment Peak. We’re almost to the base of Enchantment Peak and I’m limping; my left foot is on fire. We’re barely anywhere, we haven’t climbed anything yet, and already I’m limping. Shams tapes an insole to the ball of my foot and it helps a little, but not enough. Paula’s feeling pretty tired too and we decide to sit at camp while the others summit. I can feel myself retreating into quiet. I’m angry at my body and I feel stupid. My pack isn’t unreasonably heavy and it’s still too much. My boots are perfect in so many ways except this, and I’m at a loss. While the others get summit packs ready, Paula and I nestle down to wait. The summit team should be back around 5. It starts to snow slowly, startling us. Graupel really, a light, hail-like snow. I don’t realize I’ve been asleep until it wakes me up. Paula and I look at each other in mild disbelief. When we checked the weather on Friday we saw wind predicted, but no precipitation. We cannot argue against the snow falling around us, though we keep waiting for it to just magically stop. Soon we’re moving, taking everything to the middle of a stand of trees, covering packs with our rain shells and stuffing clothing left behind into waterproof sacks. We curl up next to each other with Jenny’s waterproof bivy sack over our sleeping bags, fading in and out of sleep as the snow starts and stops. I’ve only known Paula for a few months, and yet here we are, nose to nose, laughing at ourselves under a tree as people hike by, figuring out a rescue plan if the team isn’t back by 6, talking about what to do if it starts snowing in earnest. This is why I am here, for this moment and all the others like it, where we stop being random people and become something larger. All around us the lakes mirror the sky and the ground turns white and we are ok.
That night we find a bivy spot high above Lake Viviane, Prusik Peak rising in front of us. We pass around whiskey and heat food as the light fades. There is a goat on the skyline and Venus seems to rise out of its back. Headlamps dot the rocks and we can see a team benighted on Prusik. Time seems suspended, caught on an outcrop of rock. And then it is properly night, getting colder, and our bodies are slowing down. We sleep. Sunrise is pink against McClellan Peak and sometime in the night a goat has joined our camp. He sleeps on a rock above Jenny and Kyle, used to people but still cautious. We break camp and walk a bit along the lake before making summit packs and hanging the bags we’re leaving behind to get the salt stained fabric as far from goats as possible. Helmets on, ice axes ready, Paula leads us along Leprechaun Lake and towards McClellan. 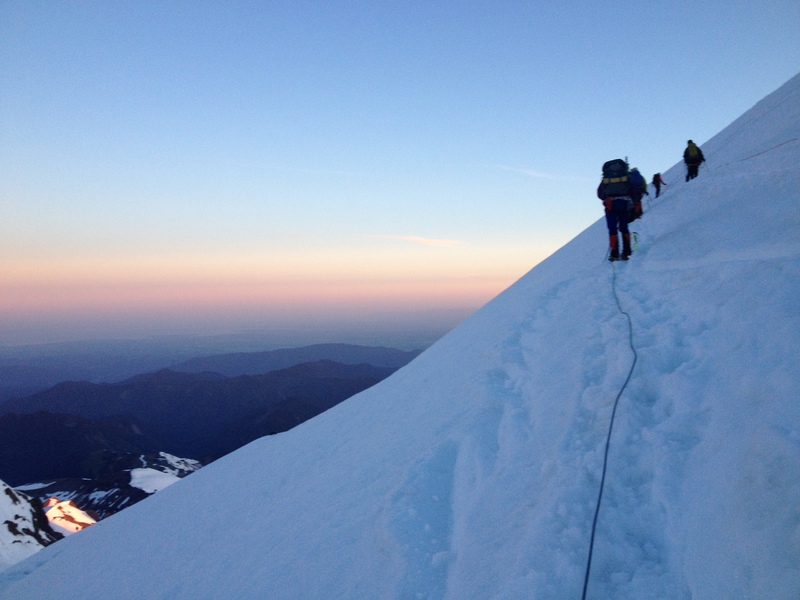 We follow the boot steps of an earlier team, snaking up the snowfield. It’s firmer than we thought, and icier. At one point I glance down and realize, this is where I shouldn’t look down. It’s steep and the run out is into boulders. A fall here is a bad fall. Paula kicks steps and we follow, curving around a rock and up to an island of trees and exposed dirt. “What do you guys think?” Paula asks. I’m sketched out. Kyle was out here a week earlier and the snow was soft, so we made the decision to leave our crampons at home. But over the week the temperature dropped; this snow is hard and we have much steeper sections to go. Kyle and Shams are a little behind us while Jenny, Paula and I talk about conditions and how, even after we summit, we have an 11 mile hike out. We decide to bail right as the guys catch up. “Good.” Both nod in approval. It wasn’t a test, exactly—they weren’t going to let us try for the summit, but they’re happy we came to the decision on our own. Another day, less of a hike out, softer snow—one small adjustment in what is in front of us and we’d go for it. But we have this: firm snow, no crampons, a late start and a long hike home. We take some pictures and pick our way back down the slope. It’s the right call, but it’s disappointing. I poke at the thin skin of ice covering Leprechaun Lake—it breaks easily and in a few hours it will melt away entirely. McClellan is behind us and, with only a few glances backwards, we start the trek home. Leprechaun Lake at the base of McClellan. The hike out is beautiful and long. At one point Jenny and I take our shoes off to cross a dam with a goat watching us. At another point baby goats frolic between trees. Mosquitos are out and find every patch of exposed skin we have. We walk across shoulders of granite. I remember this stretch, I remember having to be told where to put my feet. I remember being scared. Shams says, “I don’t think you were afraid of heights, you were afraid of death. Now you understand this differently and death seems like a more distant possibility.” We descend and descend. The final switchbacks are grueling, dusty, and hot. We play the movie game to keep moving without thinking about our feet and how we can see the parking lot and are still a mile away. It is hard to see the final stretch as anything besides not-alpine-terrain. Already the realness of sharp peaks against the sky is fading slightly, the contrast of snow against lichened rock a surreal dream. In the parking lot dust rises with each car pulling in or out and I am dazed, tired, and sore. The guys jump into Kyle’s car and head off to collect the other car. We change into bathing suits by the side of the lot, half-heartedly covering ourselves, shedding sweaty layers. I give Paula some of my water, Jenny dips into the river and I stretch out in the shade. When I finally crawl into bed back in Seattle, it’s hard to believe where I spent the previous two evenings. These weekends feel like bubbles outside of real life, full of dirt and laughter and sore muscles and one foot in front of the other until we arrive somewhere else. I find myself leaning against strangers who are no longer strangers, I find myself trusting my own body more, moving on snow with stronger and stronger confidence, moving on rock with a sense of balance I hadn’t realized I understood. Most surprisingly, I find myself writing again. Travelogues in a way; not quite trip reports, not quite essays. Whatever THIS is. There’s a project percolating. I’m not sure what it will be or who will want to read it, but it’s starting to take shape and I’m pretty excited. There’s always a new place to go. A breeze kicks up and I think—this is the first time I’ve sweat so much I see it as a biological function of survival. In front and behind me, students and instructors snake out along the hot, dry trail. My pack presses onto my shoulders and hips, uncomfortable but manageable. In front of us, every now and again, we can see the snow covered flanks of Mt Baker. Thanksgiving weekend last year I found myself drinking wine at a table in Oregon with a group of women. We were friends and friends of friends and had rented a house and headed to Smith with a turkey on our laps, a few ropes in our bags, and the makings of tradition. Some of us knew each other, some didn’t, as it is with these kinds of trips. I was explaining to one of the women I’d just met that, at some point, I had to climb Mt. Rainier. You should look into WAC, she told me. She explained loosely that it was a class similar to the Mountaineers or BoeAlps, but a little more… dirtbag. The schedule looked daunting and the gear list expensive but I figured that would be something to tackle if I got into the class. A training timed hike and interview later I was in and still not really comprehending just what it was I had signed up for. It wasn’t until we drove out to Mt Erie for one of the weekend classes and saw Baker in the background that it sunk in—we’re climbing that thing. Oh dear lord. I’ve never had ambitions to climb peaks. I grew up mildly afraid of heights and relatively uncertain on snow. When I started climbing, I started climbing sport routes. True, longer approaches never bothered me, but I wasn’t an avid hiker, and I wasn’t a peak-bagger. Then my dad died and my step-mom called me and said, I don’t know how to tell you this, but you have climb Mt Rainier. The funny thing about ashes though—they sit there, quietly, and don’t push a timeline on you. 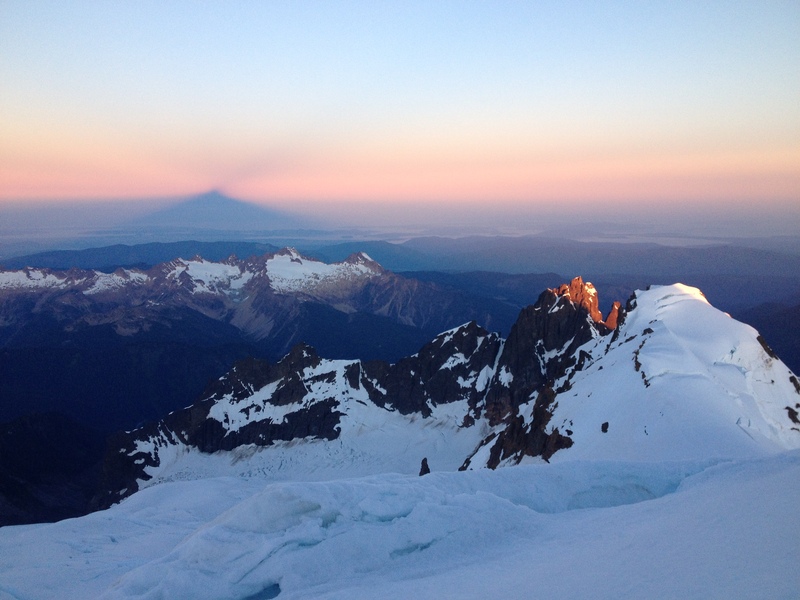 Over the next few years I became a stronger sport climber, I took some ski lessons, but I didn’t really get anywhere close to Mt Rainier. So WAC was a way to get closer—a way to inch towards a mountain that exists on the skyline like a paper cutout some days and some days is completely invisible and nearly forgotten. The hike in to Baker is usually snow covered all the way past the train head. This year we drove in easily and started on bare dirt. The river was an easy bridge crossing instead of a treacherous ford and at one point the trail was a stream bed with glacier melt bubbling over rocks. Put simply—the trail in is beautiful. Flowers scatter, trees stretch, Mt. Baker provides a backdrop. The sky is the robin blue that looks fake later, super saturated and strangely cloudless. At one point the trail cuts up onto a ridge called the Railroad Grade at the foot of the Easton Glacier. The moraine stretches grey and graveled on one side, the other side is full of wildflowers and brown earth. The difference is unnerving and, when I first rise up onto the ridge, I stop in shock. Later, at camp, my tent-mate Jenny and I boil rice pasta and rehydrated sauce, making a sticky awful mess of everything and laughing as we stab sporks into it. This is how we learn we laugh. Jet boils are for water only. So much of this class is about the small adjustments. The wrong hat switched for a warmer, smaller one. Boots tied slightly differently to adjust pressure points, strategic sunblock stops while someone else pounds water. Personal preference Shams keeps telling us, shrugging as he easily loops our rope and then shows us how to do it again. He is a wealth of knowledge but casual about it, as if it’s all as simple as breathing. He will lead our rope team, me, Jenny and another instructor Will, up to the summit. 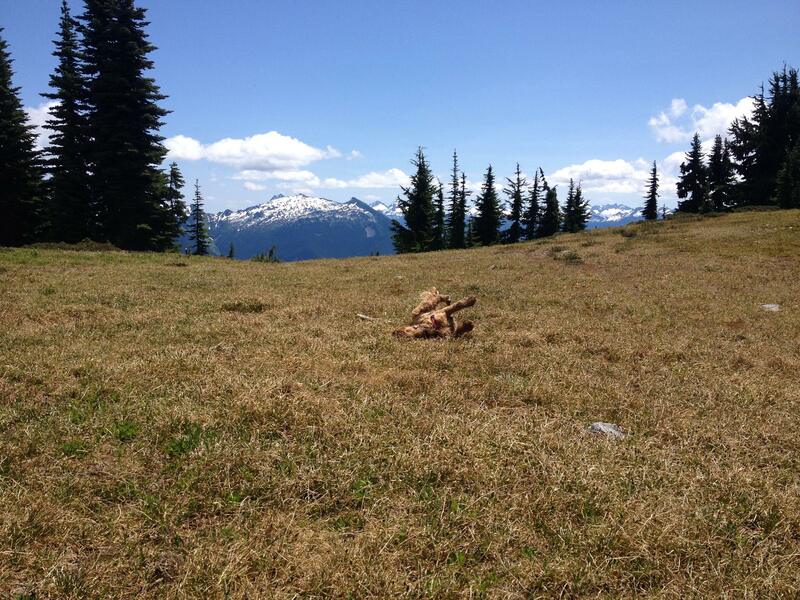 We have a photo of Gary, our teammate sitting back in Seattle with a bum ankle, in my pack. Jenny and I talk over dinner and decide that I’ll start out in front. I’m nervous, but I trust my team. We plan to leave at midnight and, at 6 pm, we try to sleep. The sun is bright and the tent, despite being on snow, is unpleasantly warm. Jenny doing blister prevention at 11 pm before we start. glows with the points of headlamps. 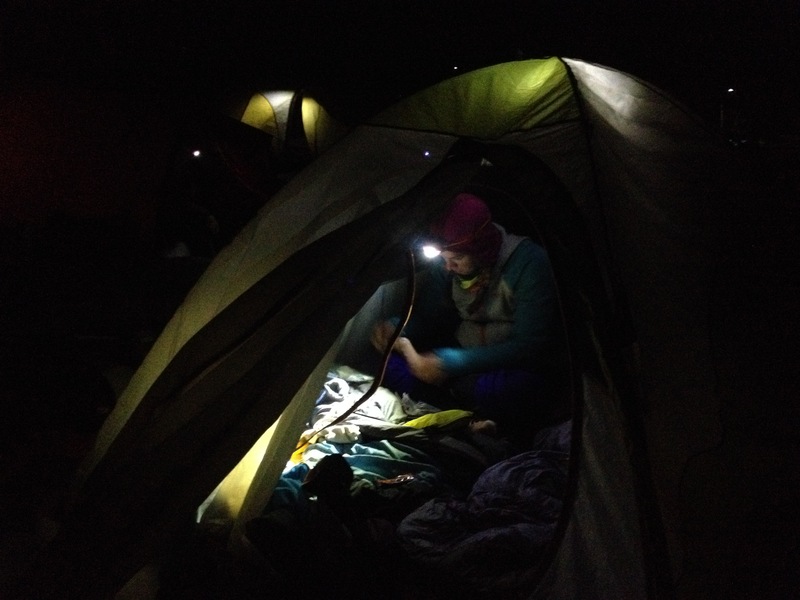 Our rope is set up already and we take turns peeing in the snow-latrine and stomping our feet, trying not to flash headlamps at each other. We slip on our harness and check our knots. Sunglasses? Water? Crampons? we ask each other, gesturing at our own packs and visually checking everything. Already the rabbit team is moving away from us and the other rope teams are falling in line. I try to get further up the line but we start too far back and end up nearly last. I can look up and see our teams stretched out, head lamp by head lamp. The great caterpillar, creeping. And it’s a creep. We start and stop, start and stop. At one point I’m behind Alex P and we watch the moon rise together, a strange bloody red. This is so cool we tell each other. He calls out the crevasses as he comes to them, and I call them back to Jenny. Over! Over! as we step across safely. I’m tied to Jenny but here, in the front, I am in a bubble of my own light, stepping one foot after the other, following the shadows in front of me. It’s easy to lose track of time in the dark. The wind picks up and dies down, strangely warm. The moon rises higher and turns silvery. At one point Shams replaces the batteries in his headlamp and whoops with joy when the beam shines brighter, but we’ve fallen behind and I can’t see the last person from the team in front of us. The footsteps are there, in the snow, and I sweep my headlamp in front every few feet, looking the flags that our rabbit team placed. There. And then again, there. We crest a bit of a ridge and the wind picks up and suddenly, as if from nowhere, there’s another team on my right. My headlamp catches on the reflective parts of their gear but they stand silently, like sentinels. I know that we have another team coming up from the Squak glacier, but these people don’t look familiar and no one calls out to me. I look up higher and see two paths of lights, one to the left, one to the right, and I realize that this is another team, going a different direction. In the dark, I start to panic, uncertain which side is mine. The other team isn’t talking to me and I shout back to Jenny I don’t know where to go but she loses my voice to the wind and whatever she shouts back, I can’t hear. A woman on the other team finally says, I think that’s us on the right and I nod and start to move, thinking I can run parallel to them until these strangers are gone and I can find our path again. But within a few minutes their leader crosses my path and they head left and then are gone. I look up and headlamps bounce on each side, left and right. I don’t know where to go I shout again, and this time Jenny and Shams hear me. I heard someone say Ru’s name right, go right! Follow the boot pack! Shams shouts. Ok, so that is what I will do. A flag, please a flag. It’s the correct direction, of course. My panic is unwarranted and our team has stopped ahead to put on crampons. 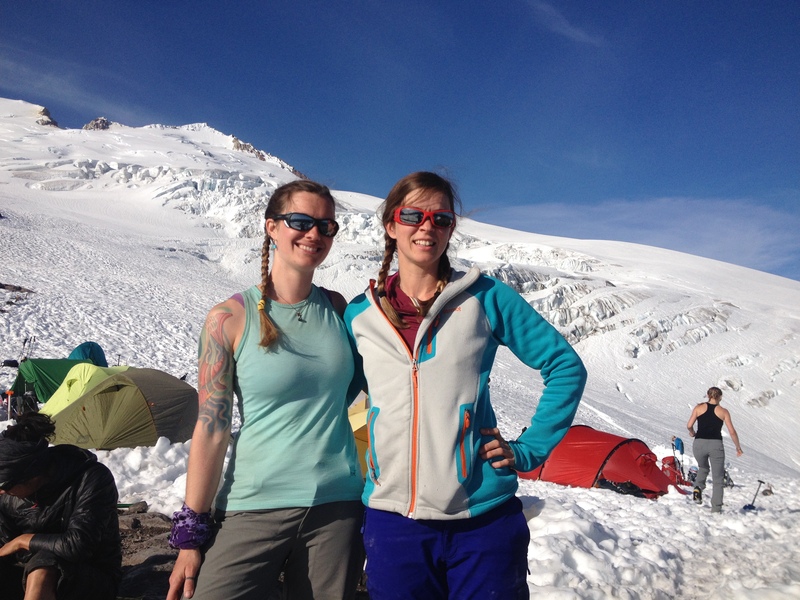 We eat quickly, strap crampons on, pee awkwardly in our harnesses and rearrange clothing. We are on the move, until we aren’t. The Roman Wall ahead of us is practically littered with head lamps and no one is moving. We stand, getting colder and colder, one big traffic jam. The horizon is starting to glow with sunrise. Shams radios to the front to find out if the route is safe enough to go two across, and it is, but no one is doing it. Are you comfortable running parallel? he asks me, but I’m not. We swap places and the caterpillar starts moving again. We are at the base of the Roman Wall as sunrise starts properly. On either side, the buttes catch the first few rays and in front of us, the shadow of Baker against the sky. We are on that mountain I think. And also, this is so beautiful, and this happens every morning, whether anyone is here to see it or not. We keep moving, left foot, right foot. Shams keeps calling back, asking how we’re doing, and we give him a thumbs up back and keep going, left foot, right foot. It’s steep and it blurs together, left foot, right foot, until suddenly the grade mellows out and I think we’re near the summit. Shams stops and shouts back Sunglasses ready! Though it’s still dark the sky is paler by the minute, but I don’t expect the sudden burst of light as we crest. I can’t explain it—like something hitting your sternum without any force but all the force in the world. And then, the summit. We make the summit as if it were never in question, as if we were always going to be here, hugging each other, windswept smiles and sunrise spreading over the mountains around us, and then we head back down. The next morning I wake up in a rented bed in a rented cabin with some of my classmates and think, at this time yesterday, I was on top of a mountain. I feel like something should feel significantly different, but it doesn’t, exactly. The house wakes up around me and I feel stupid thinking nothing is different. Here we are, no longer strangers, a map in front of us, planning new trips, our bodies sore from the day before, laughing and drinking coffee. We tumble through the day, swimming in a river, climbing on logs, eventually packing our cars and dispersing back in to our everyday lives, to do everyday things. Already emails are coming in, photos are starting to flood various social media platforms. Our smiles plaster everywhere. Already we’re planning what’s next.